It housed 20,000 men in prefab wooden huts with corrugated iron cladding and roofs, wood burning stove in the centre and about 30 men per hut. As the building materials arrived at Dinton Station and required hauling the 5 miles to Fovant it soon became clear that a spur railway line would be essential. This was used for moving stores, equipment, wounded personnel and occasionally villagers. Soldiers marched. At least one Brigade, arriving in the small hours one cold December night, sang to cheer themselves up as they marched to camp. Not so popular with tired villagers! The main part of the camp was on East Farm stretching from the downs north to Fovant Woods, a mile in distance and half a mile wide. This comprised five groups of accommodation and recreational huts (cinema, YMCA, Post Office) Officers’ accommodation and HQ Offices as well as parade ground and training facilities. There was also a hospital which began small, dealing with accidents and illness occurring with the building of the camp and early training accidents as the soldiers arrived. It increased in size and function when soldiers, wounded in France, after treatment in main hospitals, were sent to Fovant for rehabilitation and retraining. According to the archivist of The Army Medical Services Historical Society, it was “21 beds for officers and 588 for Other Ranks.” It was a military Hospital staffed by AMC and QAIMNS personnel with medical gymnasts, masseurs, electrotherapists and Dentists. They were assisted by VADs, local girls (and at least one boy who helped in the wards until he was old enough to enlist himself), members of the British Red Cross and St John’s Ambulance who had combined for the duration. The Royal Engineers built their camp on the hill behind The Cross Keys Pub. This later included secure accommodation for German POWs who worked in the camp and on farms in the neighbourhood, and cells for soldiers who had fallen foul of the Army laws. The Royal Artillery’s camp was on West Farm to the north of the main road. It had its own YMCA Hut but otherwise shared facilities with the main camp. But Fovant camp was made up of three parts. The second was a small group of huts 2 miles to the west of Fovant at Manor Farm, Sutton Mandeville. It was administered from HQ at Fovant but had its own Post Office, YMCA and training grounds. Five miles to the east of Fovant land was requisitioned from the Hurdcott Farms. Here another camp was built by the British Army and was occupied by the East Lancashire Regiment in September 1915 and other British units until March 1917 when it was taken over by the increasing number of Australians arriving to play their part in the conflict. It was designated No 3 HQ Depot in the West for the Australian Imperial Force. Accommodation was increased and a hospital was established which had an average bed occupancy of 175 but could be increased as needed. When the camp was swept by Mumps and Measles early in 1918 the MO reported 330 patients. This hospital was military and staffed exclusively by AAMC staff. No locals seem to have been employed. The third hospital administered by Fovant HQ was a Recuperation Hospital at Tisbury, four miles west. The Chairman of the Tisbury branch of the British Red Cross was able to report as early as November 1914 that they were trained and ready to provide care as soon as was needed. It predated the military hospital at Fovant. The Rector had offered his Vicarage which needed a few changes but was quickly made ready. As numbers increased another small cottage (Trellis Cottage) was likewise prepared and soon in use. There was a total of 49 beds staffed by VADs of local girls with three registered nurses in overall charge. The local GP was available when needed. 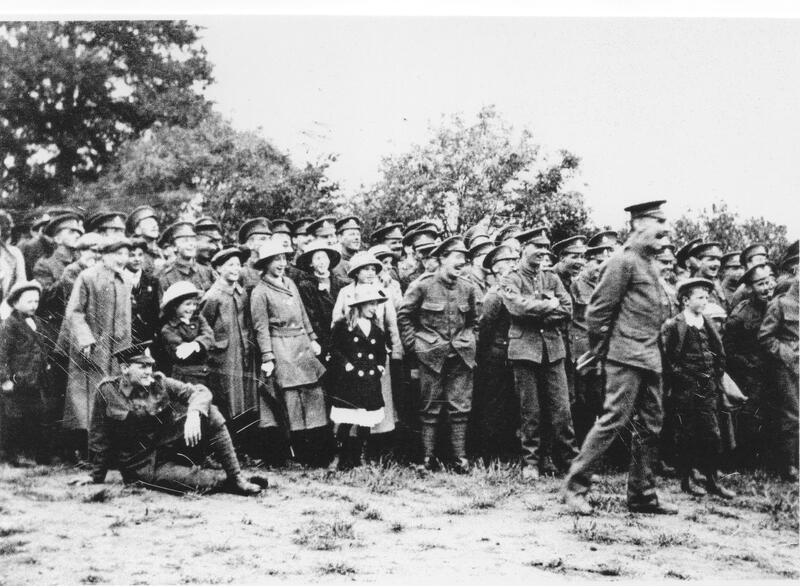 When the fighting finished Fovant was one of three camps in the South West designated as demobilisation centres for returning soldiers. Soon trainloads were arriving to hand in their uniforms and weapons, receive civilian clothes a small amount of money and train ticket home. Some days as many as 40,000 were processed in a day. Unfortunately, more than train tickets were needed for the Australian soldiers who stayed in Hurdcott for many months. Lacking the motivation of training and the structure of army discipline, boredom quickly became a problem. Unlike the fatal rioting on the Plain there was a little “rowdyism” at Hurdcott. One farmer tells of being stopped by a barricade at the camp entrance and made to drink a pint of beer with the ‘guard’ before being allowed to continue to his home at Fovant. We were here. Remember Us. What makes Fovant unique amongst Military Camps is the number of Regimental Badges carved into the Downs overlooking each of the sites occupied by soldiers during the Great War. The white chalk revealed by digging and highlighted by extra chalk pounded into the design stands out clearly against the green of the turf. It all began with the men of the London Rifle Brigade in 1916. 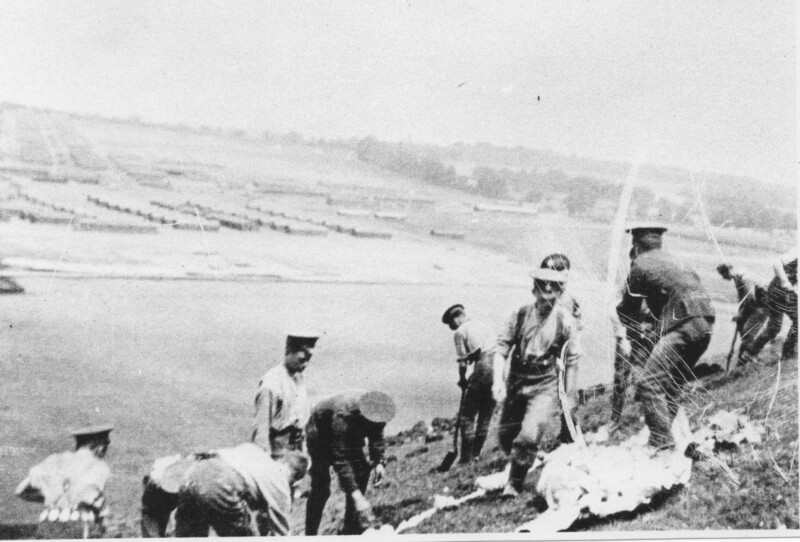 Despite the slope of 30 degrees which makes digging and hauling chalk a difficult job the men were keen to leave a clear reminder of their Regiment’s presence in the camp. They knew that they were heading for dangerous times in France so, although they were looking forward to the adventure and camaraderie of warfare, they realised they might not return. Were the insignia meant to say, “We were here. Remember us”? It was necessary to work early in the morning (the wakeup call was often 4am.) because the rifle ranges were set along the bottom of the Downs and rifle practice started at 7am. This often meant a quick decent was called for, men sliding down the slope on their shovels. A method probably not used by those issued with pickaxes! The badges look deceptively small from a distance but up close, standing beside them, their scale is overwhelming. Some are 50mX25m which is a lot of digging. The resulting LRB badge caused much action amongst the other Regiments who stove to create bigger and better badges. By the end of the war there were at least 20 at Fovant, with many smaller crests and regimental numbers. At Hurdcott there was a large map of Australia and at Sutton were two more badges – The Royal Warwickshire Regiment and The 7th Battalion, The City of London Regiment (“The Shiny Seventh”). During the years these memorials have been kept, more or less, clear until in 2000 a massive restoration plan was activated. The fuller story can be found here. I know it is probably impossible but I am trying to find any information about my Grandfather Frank Earnest Harding, who was in one of the camps at Fovant.He was in the Army Service Corps. Remounts ,from 1915 till 1919.He served in Salonica and servived the war. What information are you looking for and what do you currently know? Thank you for your comment, I’ll have a search and see if I can find anything about Private George Norton.